The village of L'Escala, was originally a small fishing village. It was the place where the inhabitants of Sant Martí d'Empúries had a safe place where their boats and sail out to sea. Over the years the village has grown far exceeding the size of the town that gave birth, Sant Martí d'Empurias. You'll find charming little old town, with its scent of sea. If you decide to walk around l'Escala, better do it at sunset, you will startle with the colors of the sky and sea. 1. - Where to go? • Parish Church Sant Pere. Belonging to the eighteenth century, located very close to the town's main beach. • Museum of the Anchovy. One of the most common purchases while passing through the town are the anchovies, with appreciation beyond the village. Find a museum with temporary exhibitions, in addition to that we can visit regularly. • Campus Empúries ruins. Ancient Greco-Roman city founded in 575a.C. A must for history lovers and those who are not, therefore, has international recognition. Itself constitutes a visit. • Empúries. Historic hotel founded in 1907. Precursor of tourism in the area of the Costa Brava, where had not yet coined the term Costa Brava. Initially housed archaeologists working in Empurias. 2. - What to do? Leisure activities you'll find in L'Escala are many stand out especially all those that have to do with the activities of sea. • Restaurants: near the town's main beach you'll find plenty of restaurants, all profiles, some more touristy than others. • Sea activities: kayaking, canoeing ... are some of the activities on offer from the village. • Beaches: a part of the town's main beach, you will find some other small cove nearby. Walking to Empúries you'll find the longest beaches and spacious. 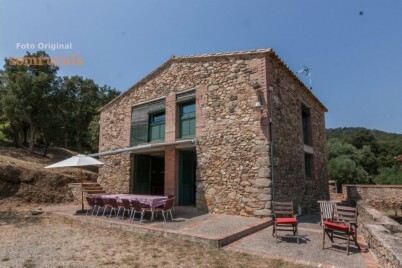 If you want a house near L'Escala, to enjoying the town, we recommend to visit our cottages in the Alt Empordà and farmhouses in Girona. Cottage for small and private groups. Terrace with barbecue. Totally isolated rural house ideal for groups. Barbecue, pool and a large garden.